In the process of engineering new products, development teams typically need to deal with multiple design objectives and constraints to find an acceptable trade-off. Balancing performance and costs, while taking into account the design constraints imposed by manufacturing realities and regulatory requirements, is but one of the many examples. Although the optimization process could be relatively complex, the smart use of state-of-the-art technologies facilitates engineering teams to quickly unlock the full potential of any new product they are working on. the ability to choose the optimization algorithm that is most suited to the engineering problem at hand, even allowing optimization experts to add their methods. The first challenge of any engineering optimization project is that the optimization problem itself must be well defined. That may be more complex than it sounds, with design objectives conflicting and usually not entirely achievable within the imposed constraints. The ability to accurately explore and understand the goals and constraints therefore represents a crucial first element to solving any engineering optimization challenge. 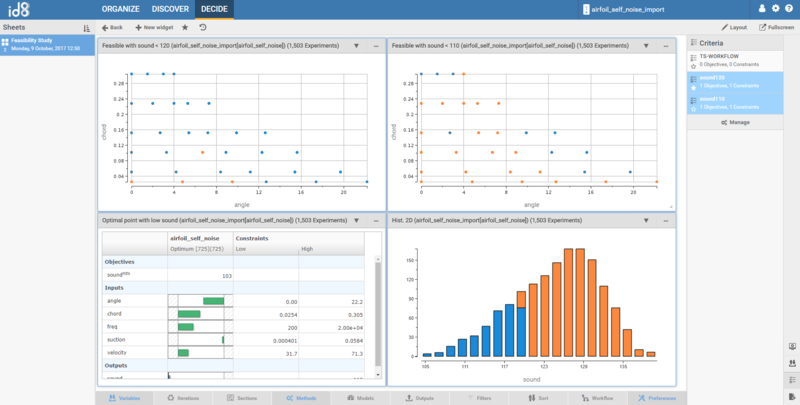 During this webinar, we’ll be showing you how id8 decide can be used to process engineering data on the fly and perform rapid what-if optimization analysis. Once different objectives and constraints have been defined, id8 decide can be used to interactively evaluate how much a constraint on the original engineering problem is impacting the optimal solutions. That makes it possible, for example, to check if a significant performance improvement can be realized with a small increase of the cost, or whether production costs can be substantially lowered by reducing the target quality to a new acceptable level.